These are the first pictures of the new Triumph Speedmaster, which will join the 2003 Bonneville range. 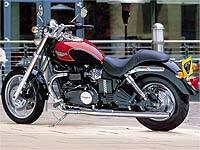 It is based around the Bonneville America cruiser. It shares the feet forward riding position and the same 790-parallel-twin motor, but has a different firing order, giving it a distinctive sound to match it’s stripped-down style. It has a lower gearing than the America, and should stop better thanks to twin front discs, rather than the solitary disc of the America. It stars pull back bars, petrol-mounted rev counter and a cast alloy rear wheel. It will be available in black/red or black/yellow to complement the black painted engine, and should cost £6449 when it goes into production in December.